Get Top Tips for Your Next Deck! 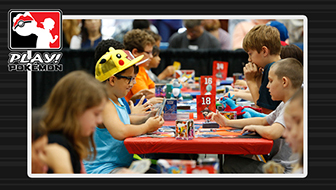 Keep up on the latest Pokémon TCG strategies with the latest articles and featured decks! An Ability is an effect on a Pokémon that is not an attack. Some will be active all of the time, while some you will need to choose to use. Read each Ability to make sure you understand exactly how and when it works. A powerful Trainer card. You may only have one ACE SPEC Trainer card in your deck. Your in-play Pokémon that is not on the Bench. Only the Active Pokémon can attack. Ancient Traits are special powers (like Ω Barrier or α Recovery) that appear on certain Pokémon cards, right under the Pokémon's name. They are not attacks or Abilities, so cards that prevent those from being used won't affect Ancient Traits. When you take a card from your hand and put it on one of your Pokémon in play. 1) When your Active Pokémon fights your opponent's Pokémon. 2) The text written on each Pokémon card that shows what it does when it attacks (a Pokémon can have several attacks on it). The Active Pokémon, as it performs an attack. A Grass , Fire , Water , Lightning , Psychic , Fighting , Darkness , Metal , or Fairy Energy card. A card you can play directly from your hand on your turn. See Evolution card. The place for your Pokémon that are in play but are not actively fighting. They come out and fight if the Active Pokémon retreats or is Knocked Out. When Benched Pokémon take damage, do not apply Weakness or Resistance. The part of each turn when the game shifts from one player to the other. Check Poisoned, Burned, Asleep, and Paralyzed at this step, and see whether any Pokémon are Knocked Out. A special kind of Evolution. When a Pokémon evolves into a Pokémon BREAK, it keeps the attacks, Abilities, Weakness, Resistance, and Retreat Cost of its previous Evolution. What you put on a Pokémon to remind you it is Burned. Remove the marker if the Pokémon is Benched or evolved. What usually happens when one Pokémon attacks another. If a Pokémon has total damage greater than or equal to its Hit Points, it is Knocked Out. A counter put on your Pokémon to show it has taken 10 damage. It stays on your Pokémon even if the Pokémon is Benched or evolved. Although 50- and 100-damage counters are sometimes used for convenience, if a card refers to a “damage counter,” it means the standard 10-damage counter. The Pokémon that receives an attack. Certain cards can devolve an evolved Pokémon, which is the opposite of evolving your Pokémon. When a Pokémon is devolved, it also loses Special Conditions and any other effects. The cards you have discarded. These cards are always face up. Anyone can look at these cards at any time. A Pokémon that has two types at the same time. Cards that power your Pokémon so they can attack. See basic Energy card. A card you play on top of a Basic Pokémon card (or on top of another Evolution card) to make it stronger. A Pokémon in play that has another Pokémon under it. A special kind of Trainer card that acts like a Basic Pokémon when put into play. When a Fossil Trainer card is in your hand, deck, or discard pile, it is not considered a Basic Pokémon. A powerful kind of attack. Only Pokémon-GX have GX attacks. A player can't use more than one GX attack in a game. A reminder tool sometimes included with the damage counter sheet. When you use your GX attack for the game, turn your GX marker face down. A number every Pokémon has, telling you how much damage it can take before it is Knocked Out. A type of Trainer card. Follow the instructions on the card and then discard it. A Pokémon is Knocked Out if it has damage greater than or equal to its Hit Points. That Pokémon goes to the discard pile along with all cards attached to it. When one of your opponent's Pokémon is Knocked Out, take one of your Prize cards. Cards sent to the Lost Zone are no longer playable during that game. Put them face up anywhere out of play. A very powerful kind of Pokémon-EX with an additional drawback: when one of your Pokémon becomes a Mega Evolution Pokémon, your turn ends. A Pokémon with a Trainer's name in its title, such as Brock's Sandshrew or Team Rocket's Meowth. Cards with , , , , or do NOT count as “Owner” cards. Object put on a Pokémon to remind you it is Poisoned. Remove the marker if the Pokémon is Benched or evolved. An effect that is active as soon as that Pokémon is in play and lasts until the Pokémon leaves play. A once-per-turn power on Active and Benched Pokémon you must choose to use. Most Poké-Powers are turned off if the Pokémon has a Special Condition. The colorful characters that fight for you in the Pokémon Trading Card Game. They are represented in the game by Basic Pokémon and Evolution cards. Pokémon-EX are a stronger form of Pokémon with a special drawback: when your Pokémon-EX is Knocked Out, your opponent takes two Prize cards instead of one. Pokémon-GX are a stronger form of Pokémon with a special drawback: when your Pokémon-GX is Knocked Out, your opponent takes two Prize cards instead of one. Each Pokémon-GX has a powerful GX attack. Special double cards that showcase powerful Legendary Pokémon. Both cards must be played together at the same time. Stronger versions of a regular Pokémon, put on top of the regular Pokémon of the same name and adding extra abilities to the original Pokémon. A special ability some Pokémon have. Pokémon Powers are divided into two categories: Poké-Power and Poké-Body. They always include the words “Poké-Power” or “Poké-Body” so you can tell they are not attacks. A special Pokémon trained by a particular Trainer, with a symbol in its name to show its owner. A Zapdos card has a different name from a Zapdos card because Zapdos is a Team Galactic's Pokémon and the is part of the name. A special kind of Trainer card (an Item) you can attach to your Pokémon to help you. Each Pokémon can have only 1 Pokémon Tool attached at any time. A powerful kind of card with a couple of special rules. cards can be Pokémon, Trainer cards, or Special Energy. You can't have more than one card with the same name in your deck. If a card would go to the discard pile, put it in the Lost Zone instead. The 6 cards you put face down while setting up to play. Every time one of your opponent's Pokémon is Knocked Out, you take 1 of your Prize cards and put it into your hand (or 2 Prize cards, for a Pokémon-EX or a Pokémon-GX). When you take your last Prize card, you win! A Pokémon with Resistance takes less damage when attacked by Pokémon of a certain type. The amount of Resistance is printed next to the type(s) of Resistance a Pokémon has, if any. A card you play with the associated fossil Item card. When you switch your Active Pokémon with one of your Benched Pokémon. To retreat, you must discard Energy from the retreating Pokémon equal to the Retreat Cost of the Pokémon. This cost appears in the lower right-hand corner of the card. You can only retreat once per turn. Asleep, Burned, Confused, Paralyzed, and Poisoned are called Special Conditions. A type of Trainer card that is similar to an Item card but stays in play after you play it. Only one Stadium card can be in play at a time—if a new one comes into play, discard the old one and end its effects. You can play only one Stadium card each turn. Sometimes both players win at the same time. In this case, you play a short game called “Sudden Death” (use only 1 Prize card each instead of 6). A Trainer card similar to an Item card. You can play only one Supporter card each turn. A kind of Trainer card (an Item) you can attach to your Pokémon. When attached, your Pokémon can use the Technical Machine attack as its own. Technical Machine cards remain attached unless the card text says otherwise. Special cards you play to gain advantages in the game. See Item card, Stadium card, Supporter card. Pokémon with Trainers' names in their titles, like Brock's Sandshrew. You cannot evolve a regular Sandshrew into Brock's Sandslash, and you cannot evolve a Brock's Sandshrew into a regular Sandslash. This is because “Brock's” is part of the name. A Pokémon with Weakness takes more damage when attacked by Pokémon of a certain type. The effect of the Weakness is indicated next to the type(s) of Weakness a Pokémon has, if any.